The Living Language project is an interdisciplinary BioDesign project, dealing and questioning the evolution of the Hebrew language and letter, using scientific procedures and working with a live organism - the Paenibacillus vortex bacterium. 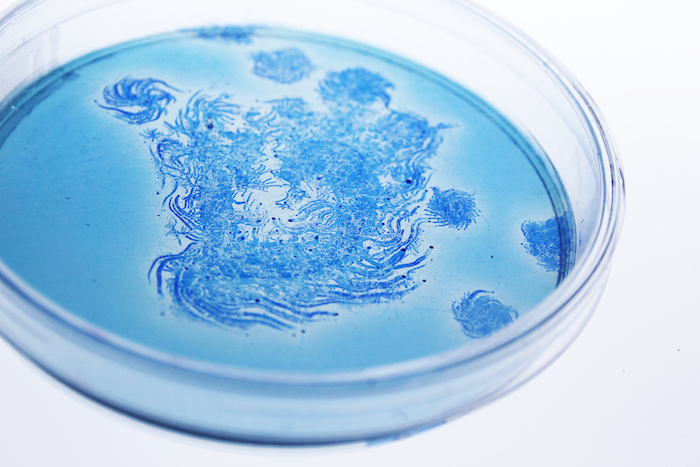 An ink created by growing Paenibacillus bacteria on petri dishes, allowing the interactions between nature and culture to be revealed. This ongoing project also explores the developing states of the Hebrew language and the Hebrew character. Using my experiments and research results, I am exploring nature, culture, character and language with new theories. Dr. Alin Finkelshtein, Lital Bachar and Mark Polikovsky from Prof. Eshel Ben-Jacob’s lab for backing the scientific espect of my project. Michal Sahar, Eran Yuval, Shlomi Eiger, Nurit Bar-Shai and Daphna Ben-Shaul for the creative guidance. This project received its first step with Eshel’s help, advice and enthusiasm.